The event will be Friday, February 1st at Securian Financial Club inside CHS Field in St. Paul. Doors will open at 6:30 pm and the film will start at 7:00 pm. “Lure of the North” profiles Blake and Jennifer Freking, a musher family from Finland, Minnesota who care for 60+ purebred Siberian Huskies. 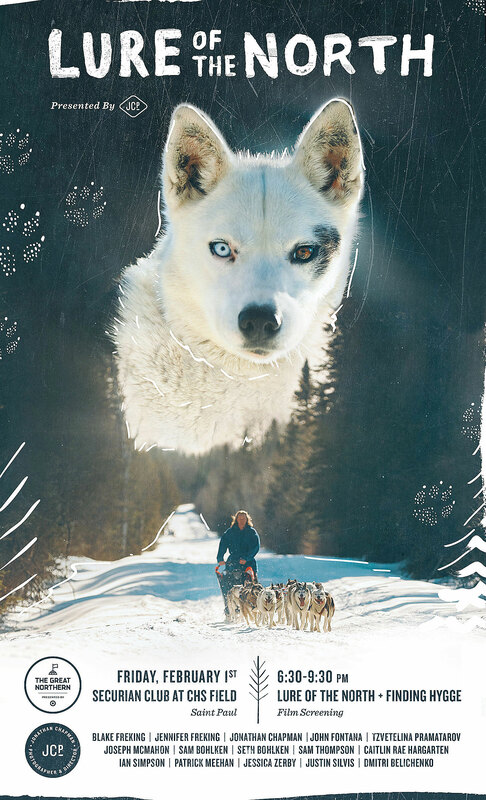 The film explores the challenges of living and raising a family off-grid in the snowiest region of Minnesota and captures the Frekings’ devotion to the sport, spirit of adventure, and commitment to the well being of their huskies. “Finding Hygge” explores the concept of hygge, which has exploded in popularity amidst growing division and distrust around the world, but the Danish word and its definition are more complicated than it seems. For those who seek happiness, this exploratory documentary travels around the globe to discover the true meaning of hygge and how to find it. The Frekings along with a few of their purebred Siberian Huskies will be in attendance to share more about their adventurous lifestyle in northern Minnesota. To find out more and RSVP to the event check out The Great Northern Festival.